I’m reaching out to all my friends on social media to help build awareness for child abuse prevention. April is the month that has been set aside to build awareness. The U.S. has one of the highest rates of abuse among the industrialized nations. Let’s change that! Be a part of the solution. 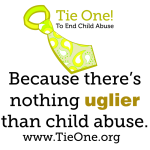 You may b e familiar with the “Tie One On” campaigns that have been done for other causes. Now there is one for child abuse awareness. You can participate by wearing an ugly tie (or a not so ugly one if you don’t normally wear ties) on or about April 22, 2016. Please take a photo of yourself wearing a tie and holding this sign or one similar, and post it on my Facebook page. You can download the sign from here, or copy and paste it. If you’re having trouble there’s another sign for download on TieOne.org. I practiced law for twelve years as a child advocate, as does my character, Sabre Brown, in The Advocate Series. Those of you who are familiar with Sabre know that she often wears ties to work, but only Jerry Garcia ties. As an added bonus for your efforts to help build child abuse awareness, I’ll be giving away an autographed Jerry Garcia tie from Sabre’s collection. (The autograph will be mine, not Jerry Garcia’s.) 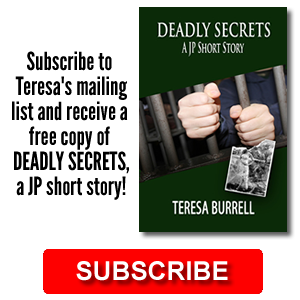 You will be entered in the drawing if you post your photo (with tie and sign) on my Facebook Page, or Tweet your photo with the hashtags #ChildAbusePrevention and #TeresaBurrell. You can also send your photo to TieOne.org and they may post it on their site. In thirteen seconds another child will be abused in the U.S. Let’s be heard–and please TIE ONE ON TO END CHILD ABUSE.